Rodil Quilab and Mereeis Ramirez swept the 21-K division top honors at the 37th National MILO Marathon in Dumaguete Sunday. Both runners received a cash prize of P10,000.00 and a trophy while clinching an all-expense trip to the National Finals set in December at the SM Mall of Asia grounds. Of 3,496 runners who competed in the race, 12 other marathoners had qualified to National Finals to join victors Quilab and Ramirez. 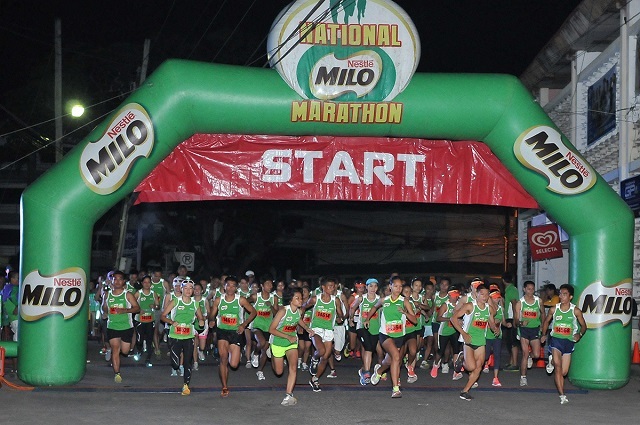 This season’s MILO Marathon King and Queen will get the chance to compete with the world’s finest athletes at the esteemed Paris Marathon in 2014. Despite today’s difficult terrain, Quilab prevailed in the half-marathon distance at an impressive 1:15:05, followed closely by resilient contenders Riez Enriquez (1:15:33) and Romulo Jr. Balinas (1:16:31). The 22-year old Iligan bet bagged the third award at the Cagayan de Oro Dahilayan Trail 55K Ultra Marathon in 2011 and drew a second place finish at the Kagay-an Festival Marathon in 2012. In the distaff side, 34-year old Ramirez proved her dominance by clocking in at 1:37:57, trouncing female counterparts Iresh Belleza (1:48:01) and Nelfa Bayonado (1:52:10). Ramirez reclaimed a regional lead title after a second place finish at last year’s MILO Marathon Bacolod 21-K female eliminations race. She copped the 2010 MILO Marathon 21-K division run by besting fellow elite tracksters in Dumaguete. As an ongoing commitment to develop sports in the country, MILO’s Help Give Shoes advocacy provides pairs of rubber shoes to various public schools across the country. A total of 500 pairs were delivered to beneficiary schools today in Dumaguete, namely North City Elementary School, San Jose National High School, Calindagan Elementary School, Dumaguete City High School, and Junob National High School. With the invaluable support of the Department of Education and the National MILO Marathon runners, MILO has given a total of 27,700 shoes to date.